Extravagant dining without leaving Stadium 2. Being honest, one of the things that I enjoy most about our annual pilgrimage to the BNP Paribas Open (the tournament likes it when I use the official corporate name) is the dining. It's an annual extravagant binge--in the fabled steak houses and the Italian and French restaurants spread out across the valley. But it looks like for 2014 we (and you, since you are going right?) can have some of that extravagance without actually leaving the grounds. The biggest news for this year is probably the new permanent Stadium 2. But, relevant to the dining issue, there are three high profile new restaurants in that new Stadium. One is Nobu. I actually went to the original Nobu in New York about 20 years ago and at that moment, it's blend of Japanese and South American cuisine was the absolute latest (and most expensive…) food available in New York, which is quite a claim. The purpose of the new stadium is to watch more tennis right? Now Nobu is a world brand with locations in Vegas among other places. The food was mind blowing then, and I am sure it'll still taste pretty good courtside. The second restaurant is the Chop House. We've eaten at a couple of other Chop House desert locations. The prime steaks and chops are very great! I haven't had the nerve to try the Tomahawk Rib Chop that weighs in at 48 ounces. But maybe you will during your time at Stadium 2. The third new restaurant is Piero's Pizza Vino, which is traditional Neapolitan style pizza with actual Italian cheese, tomatoes, and flour, baked in a wood burning oven. I am praying I can stay strong and avoid the refined carbs crust, but I also doubt my strength over the course of 10 days. All that in Stadium 2! But really the news there is 8,000 permanent seats! About half the number in the giant Stadium 1! No more scaffolds and cramming into the bleachers! More fans can see the big matches than inevitably happen there early in the tournament. Not sure you can really combine watching pro tennis with elite dining, but I'm predicting people will be there trying. Be honest is this the way you prefer to cross the street? The other biggest news, just released a few days before the start of the tournament is the launch of the new virtual Indian Wells. And by that I mean the tournamanent's new app for phones and tablets and significant other electronic enhancements. Ok personally I have the urge to run people down (I said the urge now...nothing more) when they are walking across the street in San Francisco with their heads buried in the small screen and the incredibly urgent and critical information it brings them about their important lives on a second to second basis. 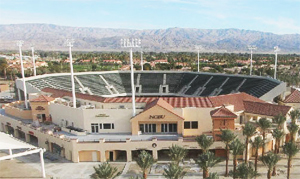 But the good news for them is that there aren't any cars on the grounds of Indian Wells--yet. And if you are truly a lover of the mobile device life style and also love tennis, you pretty much will have to come this year--for an immersion synthesizing real and electronic tennis into a field of joy. Sound too good to be true or at least unreal? I don't think so. The new IW app: your pathway to the virtual world. First the tournament will now offer free Wi-Fi throughout the site during the event. And the event's new app for both iPhone and Android has a dizzying array of features. Available in your appropriate device app store, it gives you live streaming of four broadcast match courts, plus the match and practice court schedules, match stats, and site maps to find your seats or anything else on the grounds that may prove elusive. It also has "blogs" and "social media content" whatever that may mean. Plus you can listen to BNP Radio and hear the BBC commentary team in case any of the American announcers are not your personal preferred choices. AND if those aren't enough options there is TennisTV. I'm a fan and a paid subscriber and during the event TennisTV is offering both live and on demand coverage of over 100 matches--all in HD and also available on iphone, ipad, and android. The goal, according to tournament director Steve Simon, is to make it possible to "consume" the event and share your personal electronic engulfment with your own virtual world through social media. Sounds like that goal is within reach for those who will seek it. One does hope that the tennis will still be the real show at Indian Wells. And by that I mean actually watching live players in person with your human eyes. And I am sure it will be. It always is. I looked at the entry list and it was 1 through 20 and on the men's side. And for a while, it was 1 through 20 on the women's. 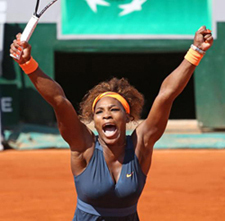 It looked like Serena was finally back. Now the hope is 2015. That's right Serena was on the entry list! But she withdrew in mid February after "careful consideration" or words to that effect. Not sure what that means. But the tournament released a statement saying they hoped she would play in 2015. And so do I. If you are too young to remember, she and Venus were loudly booed when Venus withdrew from their match those many years ago with an injury--and the charges of racism flew. Actually being there at the time and hearing the tone of the crowd, I found some truth in that. I doubt that the audience would have reacted as viciously if this had been two white players, even two white sisters. I understand why they stayed away. And I pray to god if one or both does come back the crowd makes up for what happened because whatever you may think of the sisters, it was shameful. Federer never made an issue of his back--obviously injured in 2013. For me it all starts getting exciting a few days before I load up our gear and get in the car. I start thinking about sitting in the players' dining area the first few days and literally watching the tennis world walk by. The players, stars and journeymen, the coaches, the hitting partners, the husbands and wives and girl friends and boy friends, and groupies and hangers on. But also the tennis media great and small, the tour insiders and power brokers, some very public, some very low profile. All of these mixing and talking and eating. Seeking out and/or avoiding each other. I'm proud to say I have made quite a few contacts by stalking people there--including several current Tennisplayer contributors. If you haven't checked out the Interactive Forum this month, it's a must. (Click Here.) That's this same shot you see here of Djokovic's string bed on a forehand, filmed at about 5000 frames per second. It's also there in a Quick Time so you can go frame by frame. Look closely and you can actually seem the fabled poly string snap back. Haven't been following the poly string revolution? Well we have. (Click Here.) This year we are hoping to further focus on that. There are still celebrity television commentators (who shall remain nameless) who think these strings are made of "nylon." A new Tennisplayer quest: what do poly strings do in pro rackets? If you play with poly you may have reasonably assumed that they stay in place better than regular strings since you rarely have to straighten them. That's reasonable, but untrue. They move in the milliseconds of the hit and that is a big part of the spin revolution. It's been documented, just not in pro players. But that's where we come in. Some players have poly in the mains and crosses. Some have poly and gut hybrids. Our quest is to see what our high speed cameras can see and what we can learn (if anything) about the differences. We have some other exciting stuff to pursue at Indian Wells this year in terms of content and other areas. But I don't want to jinx the potential of all that by mentioning it now. Hopefully it'll become an exciting new part (or parts) of our quest to help understand the game, and help players play it better and enjoy it more. The virtual and especially the real versions. Stay Tuned!